swF|PODs Angels offers specialized resources for both parents and educational professionals to better assist children with Down syndrome achieve their full potential. We offer a variety of publications, training sessions, and simply advice in order to better assist educators in fostering the growth of a child with Down syndrome. We are also capable of providing support, through ways not mentioned here, on a case-by-case basis. Feel free to contact us if you have any questions. 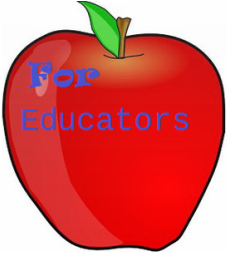 Click here to visit the resource portal just for educators! Need a pre-made presentation on Down syndrome? swF|PODs Angels partners with the National Down Syndrome Congress as well as other Down syndrome advocacy, awareness, & educational institutions across the country to create several media-derived presentations in order to help you explain the concept of Down syndrome, (as well as its implications), to others. Please click on the image on the left to visit the website where the content can be found. Looking for speech and language resources specializing in Down syndrome? Download Speech and Language Resource Guides for individuals with Down syndrome to give you a better understanding of your students' unique communication needs. SW FL PODS Angels lists various research study opportunities to make members aware of some of the research being completed regarding Down syndrome. Please note SW FL PODS Angels cannot endorse any studies and encourages members to be smart consumers when choosing to participate in any research study. See below to learn more about future, current and past research endeavors. The University of Kansas is seeking volunteers to participate in a research project to determine the effects of different amounts of intervention for children between the ages of 18-27 months of age who have general developmental delays and do not use words regularly. Please contact Peggy Waggoner at 913-588-0737 or visit their Web site at www.alliedhealth.kumc.edu/labs/fey for more information. Researchers are working to unravel a medical mystery that they hope will lead to new ways to fight cancer: they’re trying to figure out why people with Down syndrome are less likely to get certain common cancers than the general population, and why they respond better to treatment in other cancers. Recent research shows that people with Down syndrome, a genetic condition with a range of physical and intellectual disabilities, have a significantly lower-than-expected rate of breast cancer, lung cancer, mouth cancer and other common solid tumors. They are at significantly greater risk of getting a rare type of leukemia, called acute myeloid leukemia (AML), when they are children—but they have a substantially higher survival rate and lower relapse rate than children in the general population. Now, studies are being done at Children’s Hospital Boston, Johns Hopkins University School of Medicine, the University of Chicago, the Barbara Ann Karmanos Cancer Institute in Detroit, and other centers around the country, to find out why this is. By understanding the various characteristics of Down syndrome that relate to cancer, researchers hope to develop new cancer drugs, and identify specific targets for cancer treatments, that will benefit all patients. “Individuals with Down syndrome, who are too often viewed as a burden on society, have in fact provided us with a major clue that is fundamental to the health of everyone,” says Roger H. Reeves, professor at the Johns Hopkins University School of Medicine, who is studying mice to understand how Down syndrome has a protective effect against cancer. Researchers believe the answers they’re seeking lie deep in people’s genetic makeup. Much of the research is focused on Chromosome 21. Most people with Down syndrome have three copies of Chromosome 21 compared with only two in the general population. This extra copy is believed to be responsible for many of the disabilities associated with Down syndrome, such as language and cognitive deficits. But people with Down syndrome also make more of the proteins associated with that chromosome—including a substance known as endostatin that may be involved in preventing cancer. In the case of acute myeloid leukemia, efforts center around a genetic mutation that appears to be found exclusively in AML patients who have Down syndrome. Some scientists say this mutation makes the children more responsive to the chemotherapy drugs used to treat it. The Children’s Oncology Group, a consortium of pediatric cancer centers in the U.S. and Canada, is following over 200 children with Down syndrome for five years who are being treated for or have had leukemia hoping to find new insights into why. Not everyone agrees that there is something intrinsic to Down syndrome that protects people from cancer. It may simply be that this population isn’t being adequately screened for cancer so the disease may be more likely to be undetected in people with Down syndrome than the general population. There also is some concern that if a drug is designed to prevent cancer by mimicking levels of certain proteins found in people with Down syndrome, this might reproduce some of the other aspects of Down syndrome, such as learning and memory problems. Sandra Ryeom, a research associate at Children’s Hospital Boston who is studying aspects of Chromosome 21, says that if researchers develop a potential drug, they plan to run learning and memory tests first on mice before going further. The focus on the connection to cancer comes at a time of growing interest in research into Down syndrome. The life expectancy for people with Down syndrome has risen dramatically in the past decades, from an average age of 25 in 1983, to an average of 56 today, in part because of earlier intervention for health problems. That means researchers can now afford to turn their attention to improving the lives of people with Down syndrome, including boosting their cognitive abilities. It also means that they are living long enough to get diseases like cancer that mainly affect older people. For a long time, oncologists suspected that people with Down syndrome were at lower risk for cancer. Several studies published in the past few years seem to have confirmed it: The studies examined death certificates in the U.S., and health, hospital and cancer registries in countries like Denmark, Sweden and Australia, and found that the number of solid-tumor cancers were lower than expected for people with Down syndrome. Research led by a group of scientists at Beth Israel Deaconess Medical Center in Boston found a possible clue in endostatin, a fragment of a protein found on Chromosome 21. Endostatin appears to damp the development of new blood vessels that feed tumors. And people with Down syndrome have around 1.7 times the endostatin in their body fluids and tissue than typical individuals. Using mice that they manipulated to produce endostatin at levels comparable to those in people with Down syndrome, the researchers then put cancer tumors into the mice. They found that the rate of tumor growth in these mice was reduced by threefold compared to mice that had regular levels of endostatin. The finding raises the possibility of someday finding a way to elevate the levels of proteins that people make naturally in their bodies as a way of “controlling the progression of the cancer so that survival increases without increasing the toxicity that is associated with cancer therapies,” says Raghu Kalluri, director of the Center for Matrix Biology at Beth Israel and the study’s lead author. Dr. Folkman’s lab is also collaborating with scientists at Genentech Inc., a maker of cancer drugs, on a project to study a gene found on Chromosome 21 called “Down syndrome critical region 1” (DSCR1) that could be a possible new focus for developing cancer drugs. The researchers at Children’s Hospital Boston believe the DSCR1 gene and endostatin together protect people with Down syndrome against cancer. The interest in people with Down syndrome isn’t limited to cancer. Researchers are also working with Dr. Folkman’s lab to try to understand whether endostatin is also responsible for why people with Down syndrome appear to have lower blood pressure and less athlerosclerosis—or buildup of plaque in the arteries—than those in the general population. Doctors at Cedars-Sinai Medical Center in Los Angeles are launching a study later this year using electron beam computed tomography (CT) scans to examine the arteries of people with Down syndrome. “We believe that some of the same genes that lead individuals with Down syndrome to have congenital heart problems at birth might be protecting them later in life from cardiovascular calcified plaques,” says Julie R. Korenberg, a professor of pediatrics and human genetics at the University of California in Los Angeles, who is leading the study. The University of Alabama Psychology Department is beginning a new study of siblings of children with Down syndrome. This project is being conducted as part of a graduate student dissertation. We are interested in families with children between the ages of 4 and 16 years of age. This study examines strengths and weaknesses observed in children as they cope with having a sibling with special needs and will provide valuable information for future research and clinical interventions with families of children with developmental disabilities. Information for this study will be collected in two stages. First a parent will complete a brief 15-minute interview by telephone. Next parents will be mailed a survey packet of questionnaires regarding their children and family, which will take approximately 1 hour and 15 minutes to complete. The survey packet may be completed at the participant’s convenience and returned to the researchers in a stamped envelope at no cost to the participant. Following completion of the survey participants will receive a $5 gift certificate to a major bookstore. Each family that participates will also be entered into a drawing to receive one year’s membership to a local parent support group. If you are interested in participating in this study, please contact Sarah O’Kelley, a graduate student supervised by Dr. Laura Klinger, at (205) 348-9312 or by email at crump002@bama.ua.edu for more information. Read a summary of the research by Brian Skotko of Harvard University, who studied mothers’ assessment of how their physicians diagnosed Down Syndrome postnatally. Also, read the summary of the study on what mothers say about physicians’ adequacy when giving a prenatal diagnosis their babies will have Down syndrome.